Discussion in 'Face Plant' started by klopfi, Sep 17, 2007. 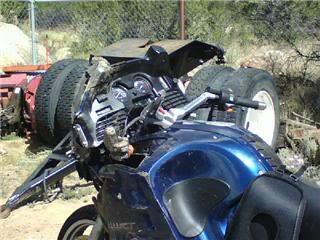 It was about 10 minutes before 7AM on Saturday morning, a few miles north of Poncha Springs on Highway 285 when out of my peripheral vision a deer appeared at the side of the road scary close - I just about had time to think "don't do that" when it sprang in front of my R1150RT. I would say that it was all of 30 feet of reaction time while running at highway speed. I thought I might swerve around the backside of Bambi's dumb cousin Yerbi - but barely had the bike changing direction when I hit the deer full on. The impact was jarring - like the mother of all rugby tackles. I had this flash of the animal looking at me accusingly as we collided - I think it was more its body snapping around the front of my beemer at the point of contact. The next thing I knew, I was off the bike on the right side and tumbling like the six million dollar man. I could see the bike sliding out ahead of me on a slight arc towards the right side of the road. I thought I was stopped and tried to stand up and pitched forward in additional tumbles as I discovered that I was not stopped yet. I had that brief moment of identification with the thing about racers going limp until they were sure they weren't moving and so I just held on for the rest of the ride. The best description is that it felt like I was riding along with everything fine and the next thing I knew, everything was not fine. Like a Bambi-bomb had gone off on me. While I didn't lose consciousness, I have no sense of the scale of the wreck and tumble. While I was taking a roll call of my limbs and digits my riding buddy came up looking more spooked than I felt: he had watched the whole thing happen in front of him and thought he might be walking up to a dead guy. Before too much time had passed some other riders had come up and displayed all those qualities in humanity that we forget about if we don't have the chance to think about things too hard. I sincerely can't say enough how much I appreciate having had the benefit of being helped by the folks who stopped to render aid - I wish I knew their names - I think there was a Jim and a Mike (LEOs from Colorado Springs and Texas? ), beyond that I don't have a clue. I wish we hadn't met like that, but I'm grateful - I think this whole thing was worse for the people around me than it was for me. The deer didn't make it. I guess I blew through the middle of the deer and left the 2 halves neatly dressed... Later the CSP trooper said he'd let me off with a warning for taking the deer without tags, but that I couldn't have the head. After the folks who were helping had checked me over and told me to lie still, we waited for the cavalry. Before too long a Colorado State Trooper arrived, the ambulance showed up and I was strapped down and bundled off to Salida's Heart of the Rockies Medical Center. Superficial scrapes to my wrist and knee. 7 stitches to my ADV-Salute finger. Tetanus shot, sprained ankle and hand. Muscular soreness from being flung down the road. Walked out of the ER under my own power a couple hours after arriving and had some breakfast in the charming little town of Salida with my riding buddy. Like the samaritan riders, CSP trooper and first responders, the folks at the hospital were spectacular examples of all the good things you can find in people if you look. As far as I can tell, all of my gear was basically wrecked in the crash. Shark RSi helmet (ECE 22.5 rating) - lower vent was scraped half off, visor and other areas scraped - no cracks and I don't think I had my bell rung at all - no headache or new signs of dain bramage. verdict: I'm planning to get another Shark helmet when I'm replacing my gear. 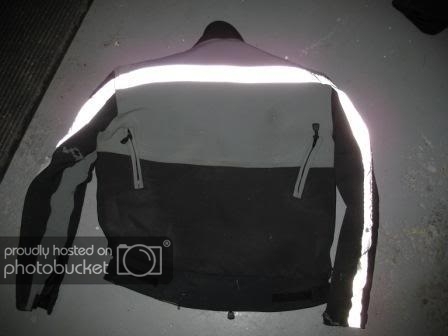 Motoport GP2 jacket and pants - I have seen a lot of people speculate in these forums about Wayne's assertions regarding the crash-worthiness of his products. Both the jacket and pants look heavily cycled and there are some tears. 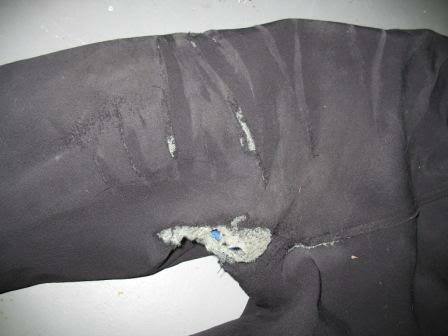 The combination of the kevlar fabric and tri-armor did their jobs: the scrape on my knee might not have happened at all if I hadn't taken the armor pieces out of my lower legs so I could zip the ankles outside of my boots (instead of the in-boot cut that I ordered). I feel pretty dumb. 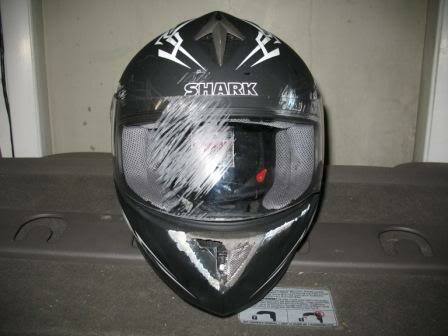 Either way, I got off the bike at highway speed and got a single minor scrape in the area covered by my Motoport gear. Verdict: think what you want, Wayne is the man - I'll definitely replace my stuff with Motoport gear as soon as I can get in the queue. 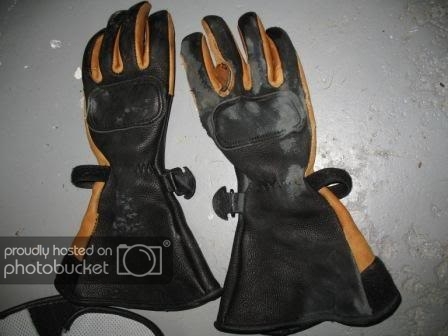 Lee Parks' deer/elk skin gauntlets - I'm conflicted on this one: these were the most comfy gloves I have ever worn, but during the crash, they split along the middle finger on one hand and that is where I needed the stitches. Additionally, my really minor wrist scrape happened under the area where the gauntlet was. On the plus side, the gloves stayed on until removed by the EMT folks. Verdict: Undecided, but leaning heavily towards gloves with extra armor over top of fingers. Oxtar TCS Sport boots - I picked these originally because of the CE rated ankle protection. My sprained ankle isn't too bad (I'm walking with a little limp) and the boots stayed on until removed in the ambulance. They took a beating (right one especially), but worked exactly as advertized. Verdict: I'll stick with Oxtar's TCS system unless someone convinces me that something better has come along. 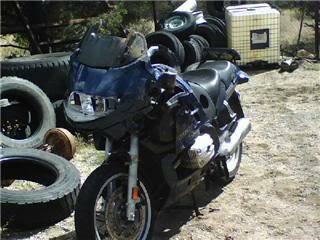 Pretty sure the bike was totalled... But, I'll let the adjusters do their thing and tell me what is what. At the end of the day, it was a toss up for what hurt worse: the stitch finger or the site of the tetanus shot! I hope the other folks riding in the Classic made it to Steamboat safe and sound. 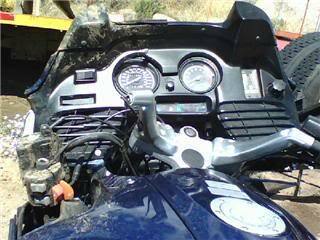 Jim: Thanks for the excellent description of your crash and for the equally excellent rundown on the gear and how it held up. This forum is very informative, and it is because of comments like yours that we can all learn how to be safer on the road. Good job on your survival and gear, and best wishes for speedy recovery for your lacerations and abrasions. I've seen Bambi appear suddenly in front of me many a time, and often been taken quite by surprise. I hope to continue to be so. Hope your insurance compensates you right for your bike. 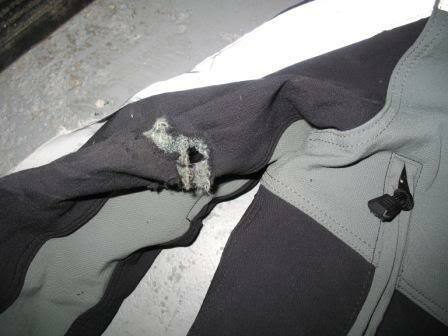 BTW, on that Motoport gear, Wayne has a guarantee, if he can't repair it, he'll replace it for free. Perfect argument for a full face helmet! Glad to hear it went better for you than the deer! Good outcome for a bad situation. I trust the Sherrif was kidding about bagging the deer out of season. Full disclosure: I'm an instructor for TCARC, have known Lee for many years, and wear his gloves exclusively. Lee would be very interested to see your gloves. I can't speak to what he might do, warranty-wise, but he has excellent customer service. I'm pretty sure the glove tore on the asphalt during the tumble - the deer's head was on the left side of the bike when we collided (right side glove was the one that tore). And I'm sure the trooper was kidding about the deer tags - I think he was happy that we could kid around about the whole thing. SheRidesABeemer Go Big or Go Home. What a testament for ATGATT. Thanks for taking the time to share it with us. I hope it gets one more person to trade in their half helmet, or buy some riding pants. Just trying to visualize your injuries if you'd been wearing an open-faced helmet, tennis shoes, Levis and an 'I Love Beer' t-shirt. Glad you're OK! Glad you made it through without breaking anything. Do you have any idea how fast you were going at the time you went down? Hope the insurance comes through and you heal quickly. I think I was going about 65 mph just before the deer popped up on my radar. For a 65 MPH deer slayer, you done good! Great report. Thanks for sharing. Where is that drive by trol? I've toyed again with going with an open-face (3/4) helmet for comfort reasons. Then along comes pictures like yours that remind me of why I will stick with my Shoei. Thank you for the report, and I'm glad you're OK!! Maybe the moral to this story is that deer hide is not a good protector in crashes. The deer got cut in half, so his hide failed him. The riders gloves made out of deer skin failed, and he needed 7 stitches in his finger. Perhaps that is the deer's revenge that the rider was wearing deer skin gloves, and they caused him injury when they failed. PS. I am glad you were not badly hurt in this accident. Thanks for telling your story so well. I am glad ATGATT (and a pinch of salt) saved you from further injury. What improvements or enhancements will you make to your gear after this learning experience? 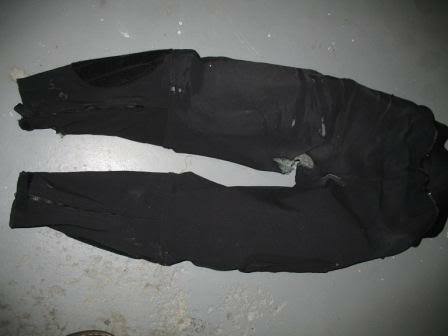 (other than a F-350 diesel 4x4) padded shorts? 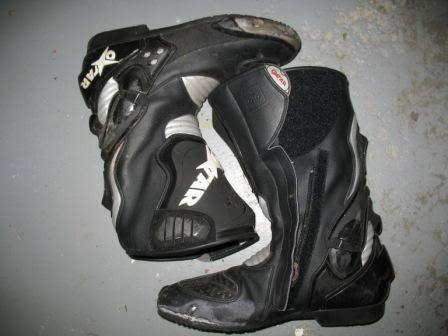 motocross style boots? knee guards? Learning from others mistakes/accidents is the only reason I am alive! I think if I had the good sense to have left my knee and shin armor in my pants, that would have covered me for the knee scrape. More protection in the gloves is the thing I will be trying to upgrade. Since it wasn't a seam failure, I'm thinking some of that po-boy racer action across the top of my knuckles is the way to go. In terms of boots, I'm guessing I will either stay with the racing style ankle protection (the Oxtar TCS worked OK) or maybe go with something in a sport touring boot like the Aerostich Combat Lites. And maybe louder pipes... I heard somewhere that they save lives. Also glad to hear that you are okay and always appreciate people's reviews of gear that has truly been "tested". BTW, you have a great writing style. Thanks for posting that, I went through that same area yesterday. I am gonna have a lady friend of mine that wants to buy a bike read this, maybe ATGATT will sink in without pain on her part. ....And maybe louder pipes... I heard somewhere that they save lives. You should try to convince Gary of that! (We havn't met, but I'm a new RC this year from Casper) Say, did you save the helmet for a visual on the importance of full face? It would make more sense to believe that safety gear will not always save you from all injury, but you can damned sure be confident that it will save you from a lot more pain than you would endure had you not been wearing it. Also, some things just fail - and animal skin is a very uncontrolled material when it comes to consistent mechanical properties!